Many of the great names in Australian Football are not Anglo names consistent with Australia's largest migration contributor, England. A great number of the game's stars have been first, second or third generation Aussies whose recent family tree consist of languages other than English. Players from the past like Alex Jesaulenko and current champs like Anthony Koutoufides have made the sport their own. 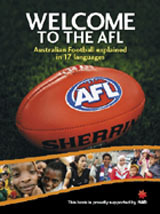 In the last couple of years the AFL has increasingly encouraged Australia's diverse migrant community to embrace Aussie Rules, as has happened in the past to a large extent without official involvement. A useful tool in this process is a simple introduction to the game in 17 different languages.